Curious to know who had commented on Justin Maker’s near perfect forward roll into the blue waters of the Mediterranean, I turned round to see a middle-aged British tourist sitting with two of her friends on the sun-baked concrete quayside beside the Blue Grotto. She laughed but declared that I’d never find her doing anything quite so stupid. And that gave me pause for thought, because that had been my opinion the day I had interviewed WO2 Cliff Pearn for the job of head Physical Training Instructor for my Unit. 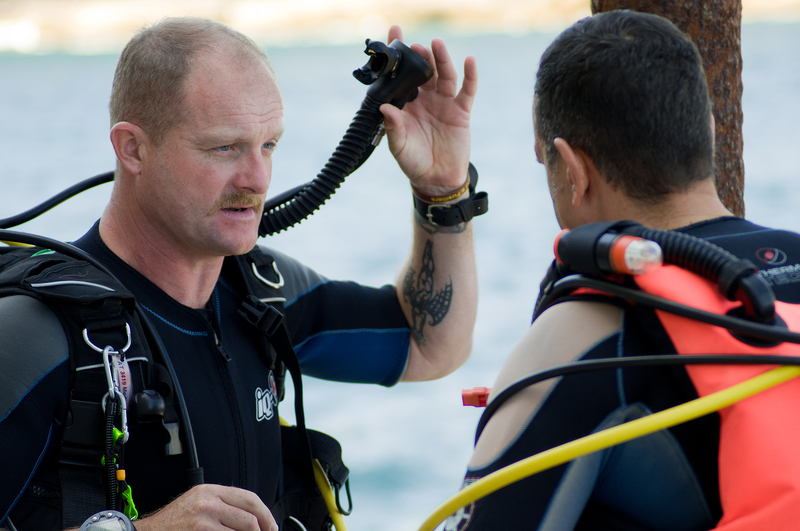 Cliff is arguably one of the Army’s most highly qualified divers as well as being a man blessed with an infectious enthusiasm for both his profession and his sport. Once recruited into the team, he set about making his mark. Part of his plan for reinvigorating the team’s appetite for physical activity included getting his pool-shy CO out of his office and a hundred feet under the waves. This is the story of how he succeeded. 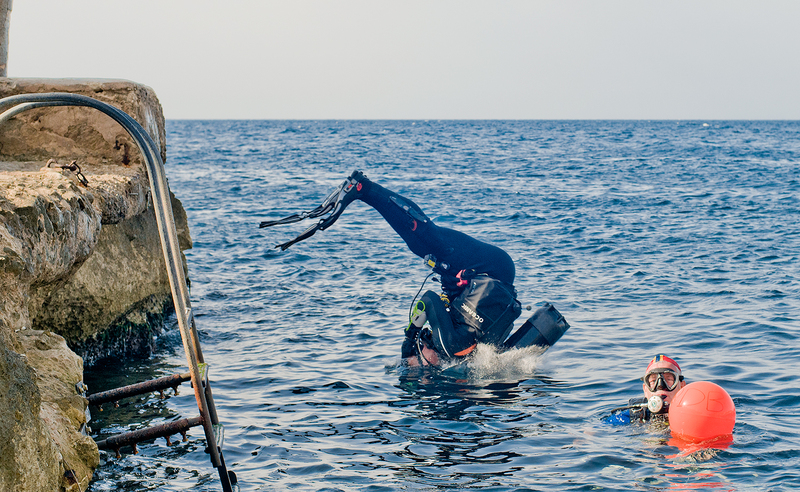 Exercise Submerged Battlefield was a seven-day diving expedition to Malta mounted by Army Training Unit (West Midlands) and financed by a range of charitable institutions including the Ulysses Trust. Our normal business was training Army Reserve recruits and other soldiers in more advanced skills at Venning Barracks in the West Midlands, but now it was our turn to be trained. For three of the nine expedition members the journey to the Mediterranean started two months earlier in the chilly Atlantic waters off South Wales. Let me be frank here: the idea of willingly jumping into the sea wearing over a hundred pounds of lead and diving kit is, put plainly, an act of borderline insanity. So, when Dave Richards, Tony Hughes and I arrived at Castlemartin Camp to begin our BSAC Ocean Diver course in June, we were seriously doubting our ability to make rational decisions. But after a week of training at the Army Dive Centre, Dave had qualified. Tony and I had developed inner-ear problems that meant we had to delay our final dives, but we had done everything else so were roughly on track. Determined to get the most value from the time in Malta, Cliff organised some pre-expedition training at Stoney Cove where I finished my Ocean Diver qualification and four of us began training for the BSAC Sports Diver. The aim was to blow the dust off our skills and get used to diving as a team. Cliff’s plan for Malta was high-tempo and characteristically meticulous, so when we arrived at Luqa at 1am on Sunday morning we knew that hard work was only hours away. Cliff had chosen Dive Deep Blue to support the expedition and they rose to the occasion wonderfully. Their equipment was in great order and they proved to be highly efficient in recharging air bottles, meaning that the schedule stayed intact. With some training still to do for the novice divers, the dive plan began at Cirkewwa. Regardless of experience, we all needed to work on either basic skills such as neutral buoyancy or leading less experienced divers. During one of the final Sports Diver exercises, I found out the hard way about the pitfalls of grasping sea urchins. The last pieces of spine took three weeks to emerge from my right thumb! Cliff’s plan contained some challenges for everyone, not least of which was a night dive on the wreck of HMS Maori. No matter how experienced a diver is, night dives are rare and working in the dark from the start to the finish of a dive is a test of both skill and nerve. Navigating to a wreck 15m below the surface of the waves in pitch black conditions is hard enough without having to look after novices who aren’t so hot with controlling their air consumption. Pondering the woman’s opinion which had once been my own, I reflected that we had been on a long and challenging journey. 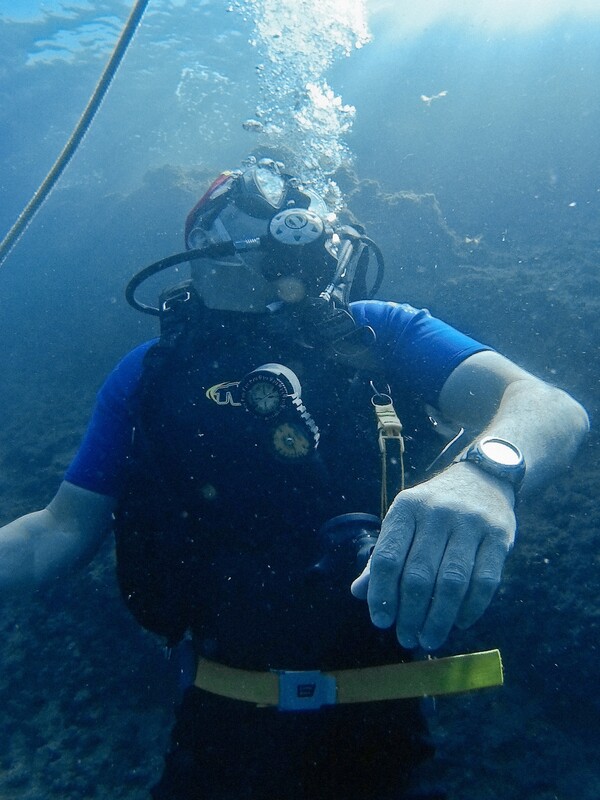 Decompression illness, air consumption, oxygen toxicity, nitrogen narcosis, casualty rescue, night diving, sea urchins, jelly fish; we had learned about or dealt with them all. And to think that for four of us, putting our faces under water was a big issue three months ago. Still, I suppose that’s what adventure training is all about. Tony Overbury glances up at the surface of the Wied iz Zurrieq inlet having positioned a marked line for testing team’s neutral buoyancy skills before heading off to explore the wreck of the Um El-Faroud. 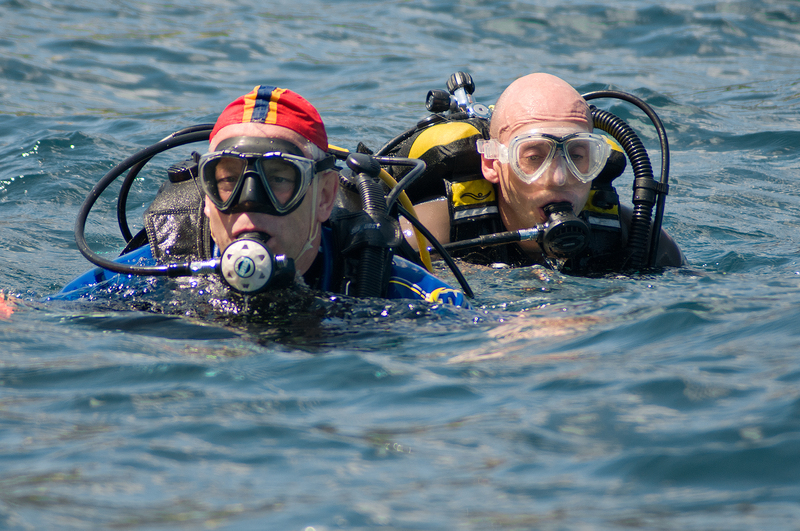 Tony Overbury (L) and Tony Hughes return from their dive on HMS Maori in Valetta Harbour. Justin Maker carries out a forward roll entry from the quayside at Wied iz Zurrieq. Dave Richards runs through his pre-dive checks with Paul Humphrey before setting off to recconnoitre the wreck of HMS Maori in advance of the night dive. Team Photograph. L/R Rob Leach, Dave Richards, Justin Maker, John Skliros, Cliff Pearn, Kev Shelmerdine, Tony Hughes, Paul Humphrey and Tony Overbury.